How Do Hospital Stays in America Compare to Other Countries? American women stay in the hospital two days, on average, after giving birth. How does that stack up against the amount of time women in other countries stay? In Egypt, women only stay at the hospital for about half a day, on average, after giving birth—on the other hand, in Ukraine they stay for an average of 6.2 days. So how does America compare when it comes to post-birth hospital stays? Well these days, women in America stay at the hospital for around two days, on average. The number is down from 4.1 days, which was the average stay in 1970, according to a PLOS Medicine study. Although these numbers only refer to vaginal births, the number for American women is on the low end of the spectrum—American women stay in the hospital for longer than Egyptian, Pakistani, Mexican British, Liberian and Nigerian women do, but they spend less time in the hospital than women from most other countries. Surprisingly, American women stay in the hospital for the same amount of time as moms in Kenya and Haiti. But when it comes to how long you stay in the hospital after delivery, is longer better? According to the CDC, the amount of time American women spend has decreased due to rising healthcare costs. People simply can't swing the costs associated with longer hospital stays—which is why Congress passed the Newborns' and Mothers' Health Protection Act in 1996. This law requires insurance companies to cover 48 hours of care for mothers who have had uncomplicated vaginal deliveries and 96 hours for women who have had C-sections or complicated deliveries. 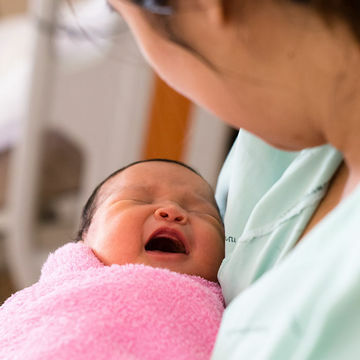 Women are not obligated to stay for the full 48-hour time frame, but the World Health Organization suggests they stay for at least 24 hours after giving birth—a critical time frame for monitoring the health of both mother and baby. According to experts, it just might be in the best interests of American women to stay a bit longer after giving birth, not just to make sure they and their babies are healthy, but also so they have a bit of guidance in mastering postnatal care. "Substantial proportions of women stay too short following childbirth to allow for adequate postnatal care," authors of the study said. "Globally, women are encouraged to deliver in facilities in the first instance because this is the easiest place to provide skilled birth attendance and evidence-based postnatal care adhering to minimal global standards. Ensuring that such care is available, and that women and their newborns stay long enough to receive it, is essential."